Xinwang Wang received his B.S. in Plant Genetics and Breeding from Huazhong Agricultural University and gained his M.S and Ph.D in Wheat Genetics and Breeding from Henan Agricultural and China Agricultural University respectively. Dr. Wang received an STA Fellowship from Japan International Science and Technology Exchange Center in 2000-2002 conducting forage crop molecular breeding and then continued to work in the National Institute of Agrobiological Resources as a research scientist until 2004. He moved to the University of Tennessee in Knoxville in 2004 as a postdoctoral research associate in conducting flowering dogwood breeding. In 2009, he joined in Texas A&M AgriLife as an assistant professor in the area of ornamental (rose and crape myrtle) breeding and genetics. From 2015, he was hired as a research geneticist by USDA ARS for pecan molecular breeding. 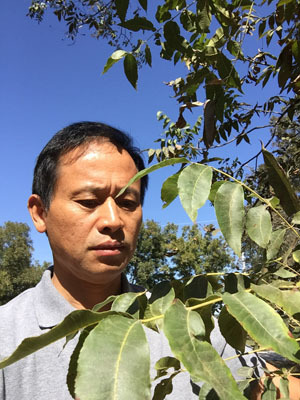 His current research goals are: 1) develop efficient molecular tools to accelerate pecan breeding for improvement of disease (scab, vine spot) and insect (aphid) resistance; 2) develop phenotypic breeding techniques for improvement rootstock and scion adaptation in various environmental conditions (salt and drought tolerance); and 3) develop qualitative and quantitative techniques, in conjunction with molecular techniques to elucidate the genetic control of certain key horticultural traits in genus Carya.